NOTE: this is a mirror post of my unreasonablemen.net blog. There have been a few posts recently about broadband in NZ, some well thought through, others not so. The crux of this issue is about scale & economics. This of course is massively applicable to SaaS too. So in the interests of clarifying things I thought I’d do a laymans explanation of scale the impacts of economies of scale & pricing. First up, lets accept the premise that any company, public or private is in business to make money. To that end they aren’t going to do things for ‘free’ just because people think they should have better services. Secondly lets clarify what we mean by ‘scale’. Scale as its used here means having a lot of use or users on a system, platform or service. The more scale you have, the larger you subscriber base. Scale is very important when you are doing infrastructure based services because your capital investment is normally very large and directly affected by the amount of scale you have to build for. It also impacts the potential returns you will get and the price points you can charge. Simply put, when you are preparing to invest or build some infrastructure like a broadband network or a SaaS application / platform you have to outlay enough to support scale while betting you actually will get that scale. 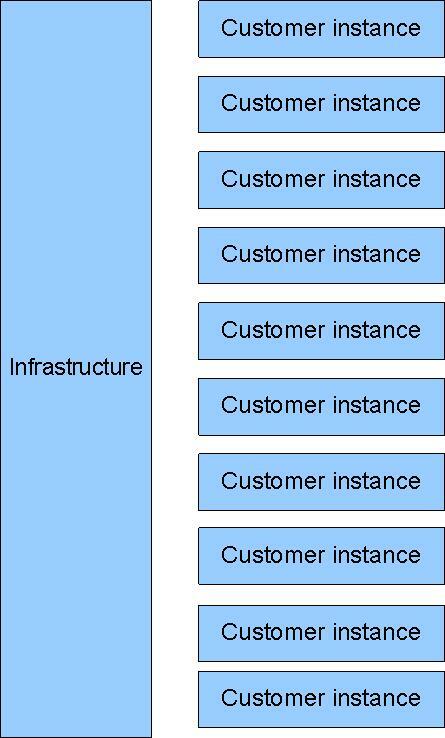 In the first diagram the infrastructure provider has not achieved scale. What this means is that their only customer will effectively end up paying for the entire infrastructure bill. To keep it simple i’ll use round numbers. A $1m investment in infrastructure then gets transferred to that one customer (this ignores infrastructure running expenses, overheads, margins and other expenses which must also be covered). So the price is $ 1m and the market size/ opportunity small. Not many can afford it. 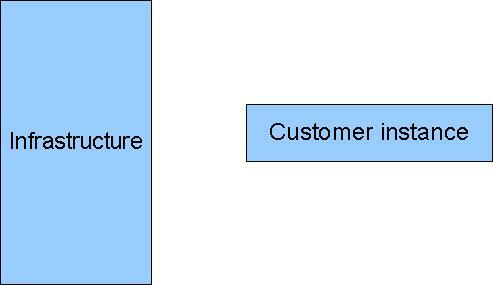 In the second diagram I am showing 10 customers subscribing to the service. This means that the price to them is only $100k. If you get 100 000 customers the price is $10. If you get a million customers and the price could be a dollar, but why would you? If the market is willing to pay $10 why wouldn’t you hold it at that level and aim for a million subscribers. This illustrates pricing for infrastructure perfectly. This is the power and paradox of scale. If you get it right you can make good profits which is economically reasonable because you are taking large risks initially. Get it wrong, then you’ve spent a huge sum on a piece of infrastructure and you don’t have the income to cover your costs. How does this affect broadband & SaaS in NZ? Having a small population definitely impacts our chances of getting scale. Having huge cities like Tokyo and LA where there are circa 30 million people living in the nearly the same geographical area as Auckland’s 1 million simply means that the Telco’s and SaaS providers there can get scale benefits easier. Added to that, these providers don’t have to worry about providing services the length and breadth of the country to get that scale, in fact they either ignore them or use the huge metropolitan based scale to fund the rural program. NZ doesn’t have that benefit. This isn’t a “tired old excuse”, just economics at work. SaaS does have one potential key scale advantage over broadband. The internet isn’t geographically limited, so we could sell to these larger populations. In this respect Xero has it spot on, going after AU and the UK markets. The reason for this is scale, pure and simple.